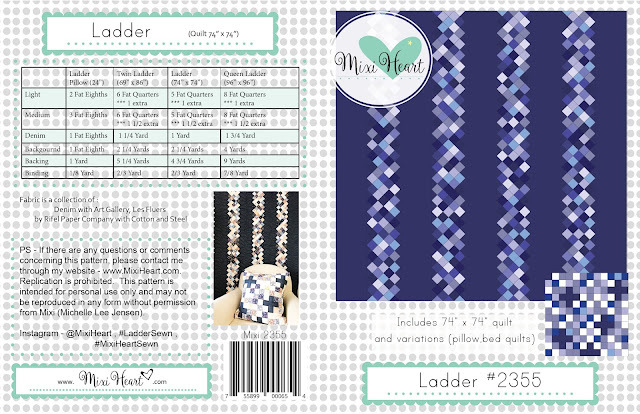 Introducing Ladder! Ta Da! It has been quite a bit since I have released a new pattern so it feels like a magic trick at this point. Our little family had a fantastic summer. We were busy with all kinds of things, but now the kiddos are back in school and that means I have a minute here and there to work on design. It is funny when I named this quilt it didn't have anything to do with what I am planning on talking about today. This always happens to me. My life is connected through these little threads sewing themselves in and out of my thoughts and dreams. But before I get to that I just love this cover for Ladder. (UPDATE - The cover has been modified to include that JELLY ROLLS can be substituted for Fat Quarters. See pattern shop for more info). It is so calming and cute! If I don't say so myself. I started and ended a decision to start graduate school this semester. I can't exactly put my finger on why I didn't stay enrolled because it was more of an emotional decision. All feelings more than reasons were pointing to me delaying that path for just a little longer. I have to admit that life feels like climbing ladders. It is almost as if I am checking things off the list and climbing up the ladder higher and higher. I ask myself if this is what I am suppose to be doing. It feels like a ladder to exhaustion at certain points. I do have so many reasons to finish my degree (graduate school) and I essentially have time to do this now but for whatever reason I felt off? I just didn't think it was right. I couldn't put my finger on it like I shared. I came up with excuses and rationalizations and even felt guilty about being a quitter or lazy. Now that the decision has been made to delay it for a bit, I am left in a weird place wondering how I got here. However, I do feel a huge weight lifted off of my shoulders because I am really savoring the time with the kids and Weston. Before, I had a calendar with all these dates on them and I was thinking about how all of these things were going to fit in with each other. I just kept coming back the question of what is the hurry? I am not in a race and I am not here to prove anything to anyone including myself. So I decided to jump off the ladder and take a detour. Through my life I have identified that you really can not have everything. With each decision you make, you in turn have to make sacrifices. I live by that and I realized that the sacrifices were there and I wasn't sure I was willing to make them. I believe that I have everything I dreamt of right now. That makes me one lucky girl. I am grateful for that. I just felt the need to drink that in and take my time and not push myself so hard. I'll get there again but in the future and perhaps in a way that will work even better for us. From now on this quilt will represent this time in my life and the decision that I made. It also will represent a few things that I have really wanted to do and I have put off. It could represent a dream come true. QUILTING - I feel so happy to finally quilt feathers on a quilt and to proudly show it off! Feathers haven't come as easily to me over the years. I have practiced and practiced. I knew I was finally at the point that I could quilt them as a feature. This quilt design for me didn't have any other thing in the open quilting space than feathers. So I held my breath and hoped for the best. Thankfully, it worked out this time. It was easy enough and they looked so cute. The fabrics that I picked to use in the ladder part of the quilt had little flamingos. I was torn at first whether or not to use them. The fabrics really needed just one little pop of something and in the end the flamingo did just the trick. The overall feathers seemed a perfect fit for that fabric addition too. DESIGN - Another thing that worked out while in the midst of the design is the pillow. I cut more squares just to have the option of throwing in all the pieces in a random style. It is difficult to do this when sewing all the pieces and you realize you have picked all the good ones and have only a majority of one fabric left. I cut extra with this in mind but you should notice that in the end I have three blue ones all touching without even realizing that I did that? So that is true random right, he, he, he. I always planned to make a pillow with those extra pieces. I came up with that design that would just compliment the quilt and not copy cat. SO PRETTY MUCH it looks adorable in my front room. I think that displaying these things is the best part of the process. To think about the time and creative juices that went into making the items it just reminds me how lucky I am to be creative and how much I love making our home a safe pretty place for my family to come home to each day. It sometimes feels strange to be in the "Entertainment/Hobby" business and one day my degree might take me into another industry though, I really enjoy working in this field here and now. Quilting is no different than SPORTS, VACATIONING, PARTIES, HUNTING, BIKING, HIKING, DECORATING. We have the luxury in our lives to enjoy hobbies that are just for fun and just for our enjoyment. While there aren't as many quilters as say Sports fans, the idea behind both are investing in fun. I wish that our All-star quilters were paid as much as the All-star baseball players because geez I think that would be pretty great! It is a funny thing to admit that we live for fun and work for a living and occasionally we have fun working. 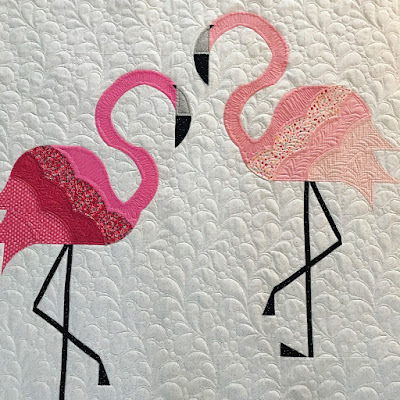 FLAMINGO FRIENDS - I made these quilts along with the most adorable flamingo pattern this summer. They are in adjoining rooms. 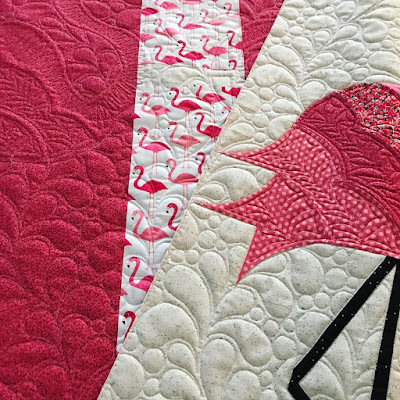 I didn't realize that I had created a flamingo theme until I was finishing them simultaneously. When I did realize, I considered how to quilt each of them to be different but complimentary. There is no doubt in my mind that the ladies behind Sew Kind of Wonderful are blessed with endless amounts of creativity. 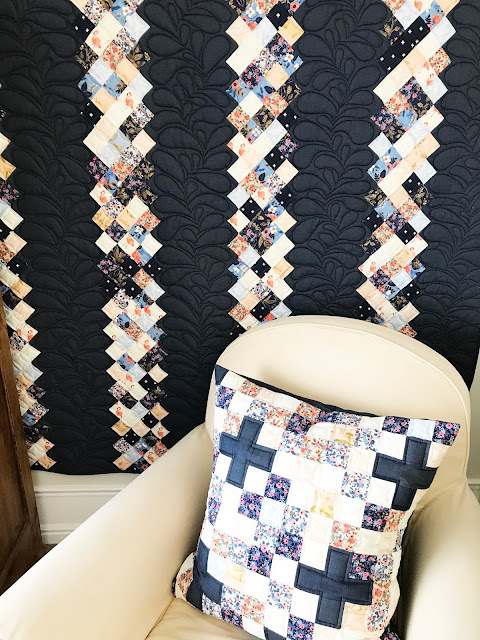 I originally was inspired by the pattern and quilting of Jenny. 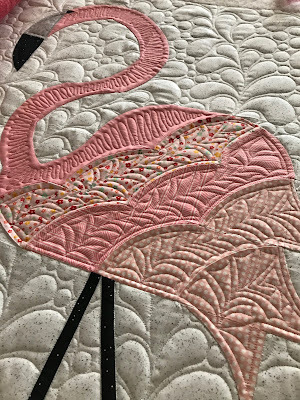 The flamingo pattern is MOD FLAMINGO BY SEW KIND OF WONDERFUL. 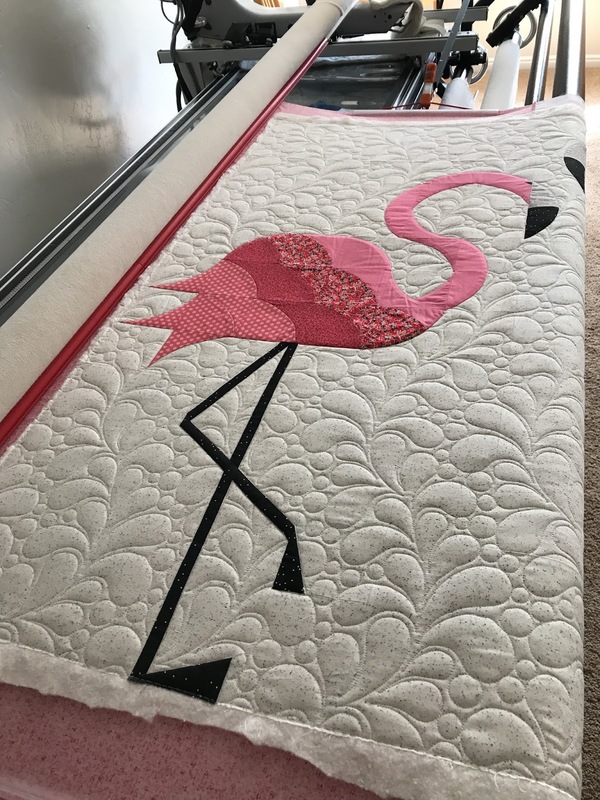 Jenny just amazes me, definitely check out her version of the MOD FLAMINGO! 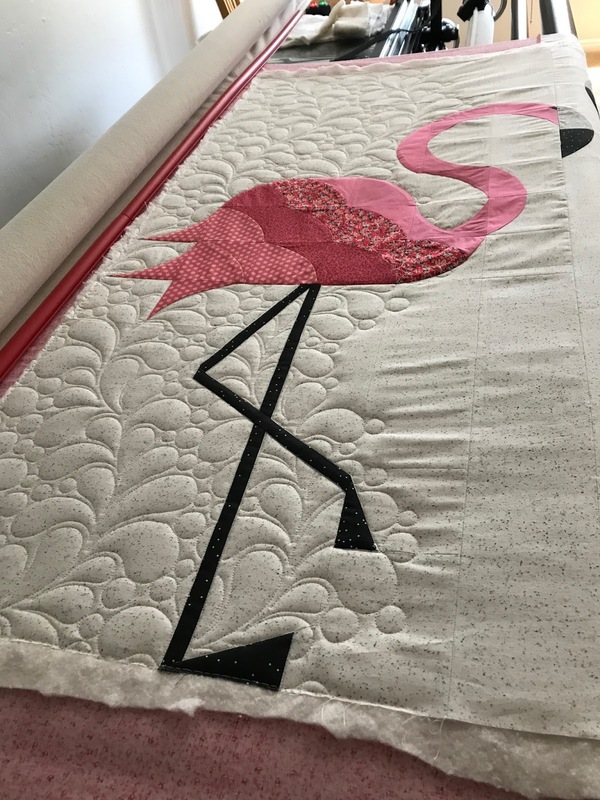 However, because I have a quilting business and because I am a little less advanced into my longarm quilting career I settled on quilting the flamingos similar to her quilt but a little different. My machine is my friend now. The more I learn about quilting on the machine the more I just love it! For the flamingo quilt I used a ruler to outline the flamingo, marked the flamingo shape, and quilted an all-over feather design in the background. I was so excited to see it as I was quilting! The flamingos were going to pop! You never know when you have a plan that it isn't going to overwhelm the quilt and it is a relief to see that you are in the clear. Inside the flamingo I added a little free-motion quilting to enhance the shape of the flamingo. I have discovered that when quilting a dense background it is still important to keep the quilting consistent. 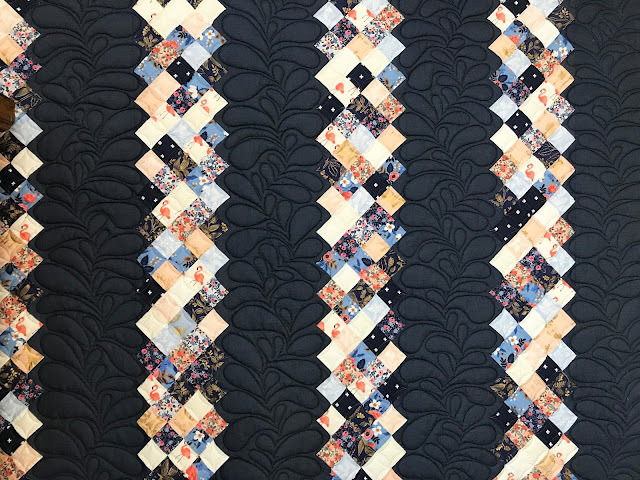 Once you take the quilt off the machine the unquilted parts look awkward if you aren't consistent and it doesn't enhance the design like quilting should. So this was the perfect amount. While it looks a little busy in the pictures in person it doesn't stand out as much and appears much more subtle. 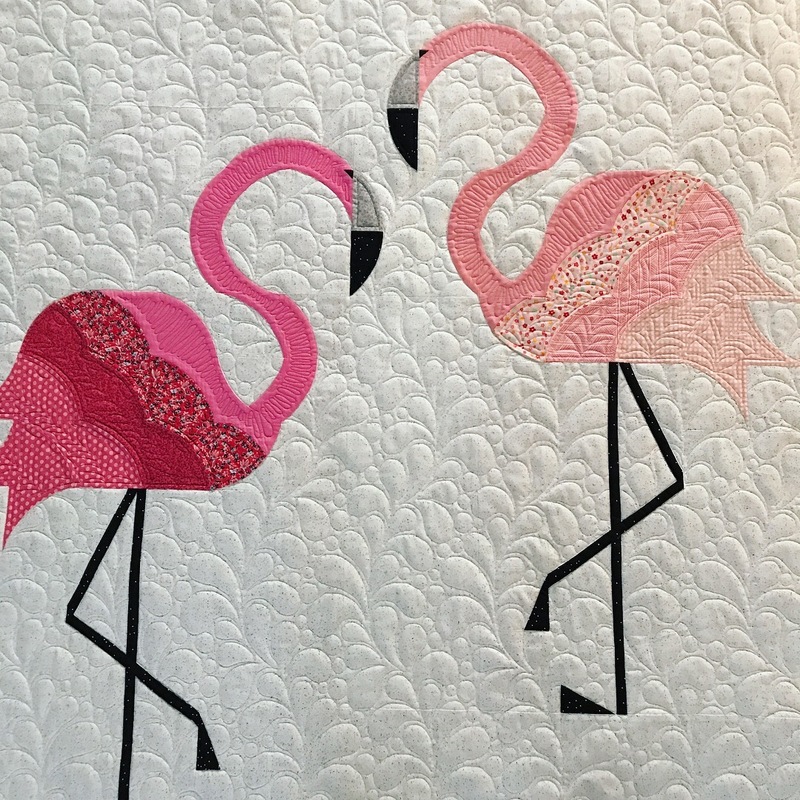 So these quilts are friends and the flamingos are friends too. Cately called dibs on Ruby which is the lighter salmony higher flamingo and I renamed my flamingo Charlotte and she is the deep pink one. Cately helped with the fabric pulls on this quilt. It is so fun to hear her opinion and makes the process even more awesome for me to have her input. In fact both of the kids often times help me with all of my quilts these days it seems at some point or another. It is almost as if it has a little piece of them too. That makes my heart happy without a doubt. Lastly, the backing. 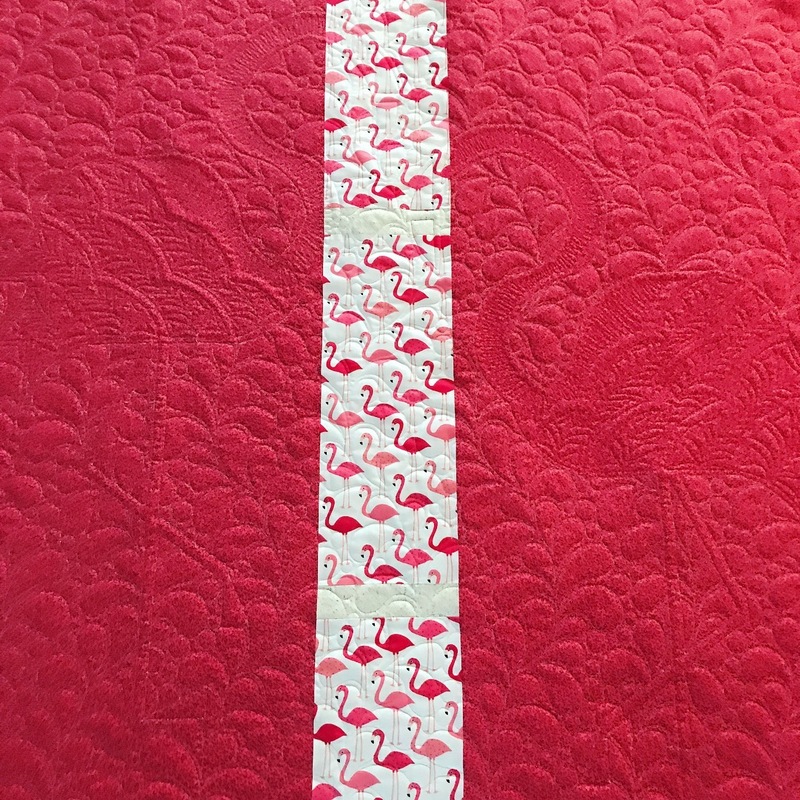 The backing has flamingo fabric!! I thought I would include that in the front but when I got the fabric home and started thinking that it would actually be weird to have that print on the front. However, it worked so romantically perfect for the back. 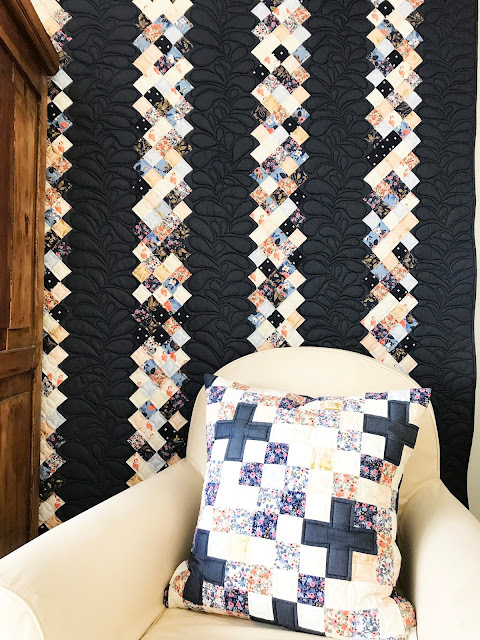 I love this QUILT!!! The most reliable way to predict the future is to create it. Don't be in such a rush to figure everything out, Embrace the unknown and let your life surprise you.